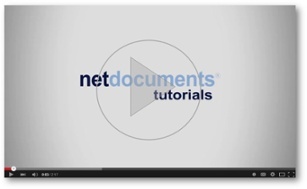 Netdocuments recently released a series of short, focused tutorials on how to do specific tasks in its service. The ndTutorial videos are located on a Netdocuments Support YouTube channel. In the initial series, videos are available for adding or removing users, performing a mass profile change, creating ShareSpaces, and defining display formats, just to name a few. This is a great addition to Netdocuments’ online information which was already top-shelf.